in the most up to date styles at Mainline Menswear available to order online. Here you can order current pairs of Diesel jeans in popular styles such as the Waykee, Larkee, Belther and Tepphar jeans in a variety of light and dark washes and denim treatments including vintage fading and distress patches. 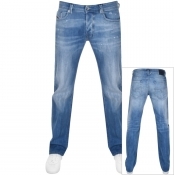 At Mainline Menswear we stock Diesel mens jeans in leg lengths 30, 32, 34 and 36 inches and have waist sizes from 28 to 40 inches in both loose and slim fits. Diesel jeans for men are completed with a woven Diesel Industry patch on the pockets and branded metal rivets for reinforcement..